Five Tips for a Better Gourmet Vegan Lasagna. 1. If you wouldn't eat it that way, don't layer it that way. With exception to the noodles, which need no treatment at all, every ingredient that I layer into my lasagna gets 'prepared' before I go stuffing it inside. 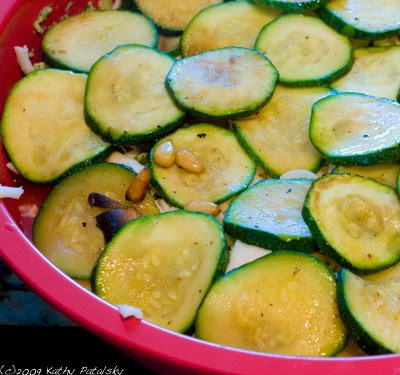 For example, with zucchini, I won't layer it in raw, I will saute it in seasonings, garlic and olive oil first-then layer it in. For tofu? I prefer to braise my tofu slices before I layer them in the lasagna. Raw tofu is quite bland on flavor. So while the flavors will soak into it during the cooking process, by braising my tofu first, it will have a delicious caramelized texture on its edges and the flavor will be much better. I do the same for mushrooms, veggies, pine nuts, garlic and any other ingredients I add in. I'll saute the veggies, roast the garlic, toast the pine nuts, etc. Better ingredient flavors and textures going into the oven, better flavors and textures coming out. 2. 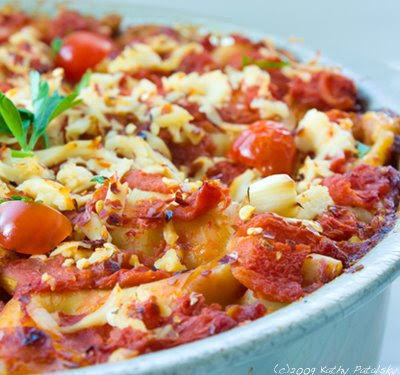 Save Time and Flavor: Use No-Boil Lasagna Pasta. I used to think that this was cheating to use the hard-simply lay them in the pan pasta strips. 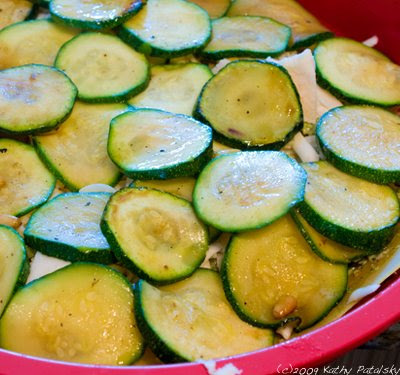 But I have come to realize that they are a huge time saver and actually increases the flavor of the lasagna. What happens is instead of the pasta strips cooking and being soaked up with pure plain pasta water, the pasta becomes marinated with flavor-packed juices from the tomatoes, veggies and other ingredients. The pasta will have tons of flavor and will also pull away any excess moisture from the ingredients preventing a mushy or soggy lasagna. Everyone knows that cheese is the big yummy fun ingredient in lasagna. Well I have two tips to re-creating that cheese flavor and fun with vegan ingredients. First, you can use a vegan no-casein cheese in place of mozzarella cheese. I love Follow Your Heart brand. It melts very well and is very flavorful. I will also use a vegan cheese substitute for Parmesan cheese-if I am adding it that day. The second tip is instead of ricotta cheese, use a pine-nut dense pesto sauce. About 3/4 toasted pine nuts and 1/4 basil and garlic and other ingredients. When cooked, this pesto will become very dense and dry-and full of flavor-and it really tastes a lot like a ricotta cheese does. Only it's much healthier and dairy-free! Again, ingredients shouldn't just be stuffed into the layers. A good lasagna isn't a everything-but-the-kitchen-sink, whatever leftover veggies and herbs you have lying around dish. Go premium on the ingredients! Premium doesn't have to be expensive. Go for the good stuff that is on sale if you'd like. Delicious-looking organic red bell peppers on sale? Do a premium red pepper lasagna. Premium meaning high, eat on-their-own quality. Use really good mushrooms. Use the good brand of firm tofu. Use san marzano tomatoes instead of the on-sale brand x variety. Use fresh herbs, real garlic, good olive oil and high quality seasonings. Using premium ingredients makes for a gourmet lasagna. And if you want to keep it cheap-use only one ultra premium ingredient like mushrooms or a really high quality blend of veggies-or like I mentioned the organic bell peppers.. Then highlight that ingredient in the dish by not using any lower quality 'filler' ingredients. Keep it simple and high quality and you will have a winner. 5. To Tofu or Not to Tofu. It seems everyone uses tofu in their vegan lasagna-right? I see it on menus, at Whole Foods prepared food section and maybe there is a reason for it. Well, I tried the tempeh lasagna thing and I played around with seitan flavor in a lasagna dish and it just wasn't the same. You may not agree, but for me tofu is indeed the protein of choice for a premium vegan lasagna. The trick to tofu is to marinate, braise or bake it first-before you layer it. Get some of that flavor-less extra tofu water out before sticking it in your dish. Another tofu tip: get creative. You don't have to do a pasta, tomatoes, tofu, cheese lasagna. That can be boring over and over again. Luckily, tofu is a versatile ingredient and goes well with and picks up strong flavor accents like jalapeno, garlic, basil, mushrooms, corn, pesto, fennel, hemp seeds, artichokes, olives, chili peppers and many many more flavors that you can build your lasagna around. Don't forget to check back for two amazing vegan lasagna recipes: Lasagna Rosso (Red Lasagna) and a Spicy Lasagna Verde made with a rich pine nut pesto sauce. And the best thing about lasagna is that it will last you a few days: less cooking, more eating!